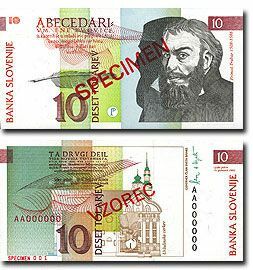 The hand engraved portrait of the Protestant Primož Trubar is the main motif on the front of the banknote. The profile silhouette filled up with microwriting completes the image. In the centre of the left hand area of the banknote the motif of the first page of Trubar´s Abecedarium is printed by the intaglio method, and beneath it a writing quill is pictured. The watermark bears the face of Primož Trubar. On the back of the banknote there is a reproduction of a drawing of the Ursuline Church in Ljubljana. In the upper left hand area of the banknote a motif from the New Testament is printed by the intaglio method. The hand engraved portrait of the polymath Janez Vajkard Valvasor is the main motif on the front of the banknote. The profile silhouette filled up with microwriting completes the image. In the left hand area of the banknote the motif of a geodetic pair of compasses is printed by the intaglio method. The watermark bears the face of J. V. Valvasor. On the back various segments of the map of Slovenia and the final vignette of two angels from J. V. Valvasor´s book "The Glory of the Duchy of Carniola" are printed by the intaglio method. The left hand area of the banknote bears the inscription „Dulcis ex labore fructus". 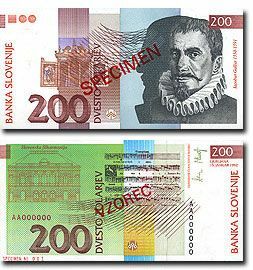 The hand engraved portrait of the mathematician Jurij Vega is the main motif on the front of the banknote. The profile silhouette filled up with microwriting completes the image. In the left hand area of the banknote the motif of the drawing from Vega´s Treatise on the Sphere is printed by the intaglio method. The watermark bears the face of Jurij Vega. The back pictures the solar system and a drawing of the front facade of the Academy of Sciences and Arts. 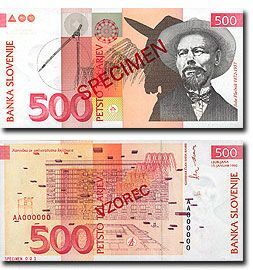 The hand engraved portrait of the impressionist painter Rihard Jakopič is the main motif on the front of the banknote. The profile silhouette filled up with microwriting completes the image. In the middle of the left hand area of the banknote a painting palette and two paintbrushes are depicted. The watermark bears the face of Rihard Jakopič. On the back a detail from Jakopic´s painting "The Sun" is represented, and the plan of the former Jakopic Pavilion in Ljubljana is printed by the intaglio method. The hand engraved portrait of the composer Iacobus Gallus is the main motif on the front of the banknote. The profile silhouette filled up with microwriting completes the image. In the central area a drawing of a motif of an organ from the 17th century is printed by the intaglio method. The watermark bears the face of Iacobus Gallus. 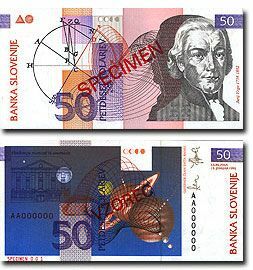 In the left hand area of the back of the banknote the front side of the Slovene Philharmonic Hall is printed by the intaglio method. The middle of the banknote bears a musical notation. Only differences between the banknotes are date of issue and/or signatures of the member of the governing board on the back side. 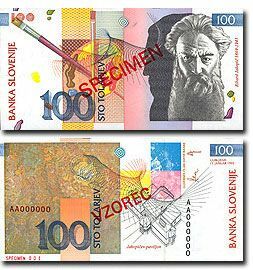 The hand engraved portrait of the architect Jože Plečnik is the main motif on the front of the banknote. The profile silhouette made in microwriting technique completes the image. In the left hand area of the banknote a pair of compasses and a circle are drawn. The watermark bears the face of Jože Plečnik. The main design of the back of the banknote is a drawing of the eastern facade of the National and University Library of Ljubljana. On the bottom of the banknote the ground plan of the Library is represented. 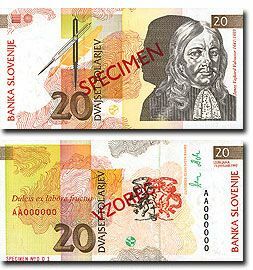 The hand engraved portrait of the poet France Prešeren is the main motif on the front of the banknote. The profile silhouette filled up with microwriting completes the image. In the upper left hand area of the banknote a facsimile of Preseren´s signature is printed by the intaglio method. The watermark bears the face of France Prešeren. In the middle of the back of the banknote part of the text from "The Toast" is printed. The upper left side bears a stylized writing quill, next to it the word "Prijatli" (Friends) in the poet´s handwriting is printed by the intaglio method. The hand-engraved portrait of the paintress Ivana Kobilca is the main motif on the front of the banknote. The image is complemented by a silhouette of her profile, which is filled with microwriting. The left-hand side of the note shows an easel and a medallion with the profile of the painter. Above the easel, on the note issued on 1 June 1993, there is a painter´s palette in optically variable ink and on the 8 October 1997 issue, a LIFT foil showing the denomination and a silhouette of the artist. On the 15 January 2002 issue, there is a hologram in the form of a palette, with a pattern of stylized flowers and the numbers "5000", both in colours which change as you tilt the note. The watermark bears the portrait of Ivana Kobilca. The back of the note shows the plan of the facade of the National Gallery in Ljubljana. To its right the ground plan and the profile projection of the Robba Fountain are shown. Both images are printed in intaglio ink. The composition ends on the right with the plan of the new wing of the National Gallery. The 15 January 2002 issue has a windowed thread with micro-lettering close to the left edge of the banknote. The micro-lettering reads Banka Slovenije. The hand engraved portrait of the writer Ivan Cankar is the main motif on the front of the banknote. The profile silhouette filled by the writer´s handwriting completes the image. In the central part of the banknote the stage plan of the former Theatre of Ljubljana is represented, with a chrysanthemum made in the technique of embossing above it. The watermark bears Smrekar´s caricature of Ivan Cankar. The banknote with the date of issue June 28, 1994: on the left of the chrysanthemum there is a writing quill in optical variable colour. The main design of the reverse of the banknote is the engraving of the chrysanthemum. Part of the original handwriting of the writer is printed across the central part of the banknote. The banknote with the date of issue January 15, 2003: in the left, upper part of the chrysanthemum a new iridescent security feature is added.